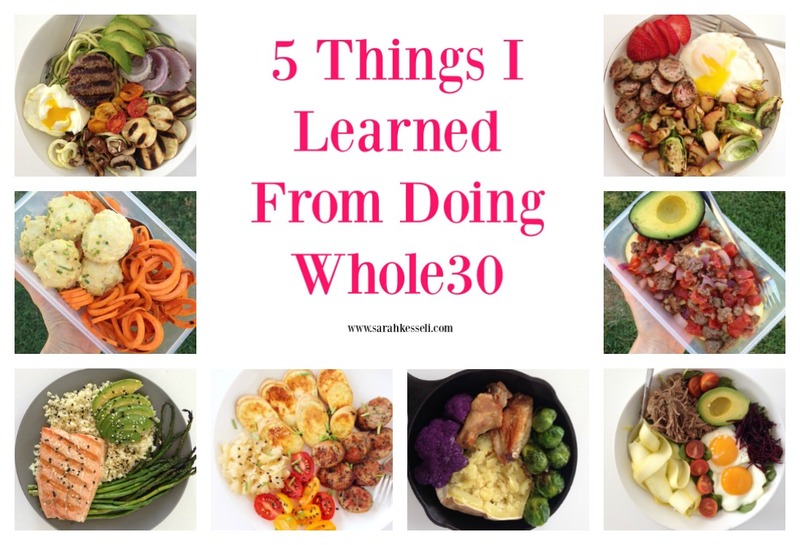 5 Things I learned From Doing Whole30 - Welcome to SarahKesseli.com! To be honest, I didn’t think Whole30 would be too hard since I eat whole foods 90% of the time. The only foods I was dreading giving up over the 30 days were Greek yogurt, cheese, and peanut butter. Oh, and all of my steam fresh legumes! As you know, I am not one to advocate for ‘diets’ given my past. However, I have had pain and inflammation going on in my body since February (a story for another day). I removed all grains back in May and felt better within 24 hours. The only inflammatory foods left for me to try and remove were dairy, legumes, and sugar. So, I figured if I am going to remove those and I am already grain free, why not just go for it all and experiment for 30 days with Whole30! Most people think that Whole30 is meant to be used as a diet. However, this is the complete opposite. The Whole30 is used as a reset to end unhealthy cravings and habits, restore a healthy metabolism, heal your digestive tract, balance your immune system, increase your energy and heal your body from injury or overuse. In short, it is used to change your relationship with food! 3) No SWYPO! Meaning, you can not recreate foods such as pizza, bread, pancakes, etc. with Whole30 approved ingredients. I know, you are thinking I could never do that! But believe me, you can! Here are some photos of my meals and what I learned over those 30 days! 1. Color is the key to satiation. If my plate wasn’t full of color, I felt much less satisfied after my meal. Some nights I would be too lazy to cook anything special and end up with a “downtown brown” dish. Yes, it was still delicious, but I almost always ended up craving something after. The more color I added to my dinner the better my meal tasted! 2. It doesn’t take much to make a delicious meal. 3. Eating whole foods is a natural recipe for energy. I am normally a very energetic person, but my energy TOOK OFF during Whole30! I was getting five times as much accomplished during the day! It’s crazy to even think that! Whole30 has a stage called “Tiger Blood” in which your body turns on it’s ‘awesome’ button, and your energy jumps through the roof! That. Was. Spot. On! 4. It’s easy to stay full. When you are consuming foods that processed (not that I am against them at all!) they are usually calorie dense and quick digesting (i.e., sugar), so you are hungry again soon after. With Whole30 I was eating so much fiber and nutrient dense foods that I felt much less hungry during the day. If you are someone who needs to lose weight then feeling full and satisfied throughout the day is a big plus! Even the small adjustments in this area to my diet made a huge impact! This probably also tied into my lasting energy – no spikes and dips! 5. Nutritional balance is key for me. For me, the Whole30 triggered cravings for sugar and salt that I didn’t have before I started. For most people starting the Whole30, this is the opposite. They are doing this to stop sugar and salt cravings. It may have been my old mindset of “restriction” coming into play. Or it could have been the fact that I wasn’t eating enough (I ended up losing 2lbs during the 30 days). I am not quite sure. However, for someone who has battled food for years having a healthy balance of both whole foods and fun foods is key. So, how did it all end? Did the Whole30 help my pain and inflammation as I hoped it would? No. I wish I could say it did. This makes me both happy and sad. Happy that I don’t have to give up cheese, but sad that I still have lingering pain. If you are interested in checking out all of my meals from Whole30 and what products I used, head HERE!